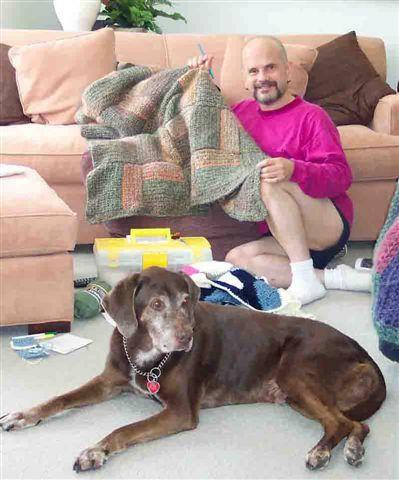 Kyle Knits - a boy, his cats and way too much yarn: One sock just ain't enough! One sock just ain't enough! This is not a good idea, however. 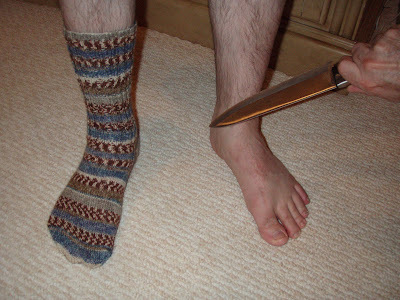 Cutting your foot off would make it more difficult to walk, and it's not a desirable fate. Lots of folks have to deal with missing a foot or leg - I also kind of think that the healing time and pain associated with chopping my foot off are a greater burden than just sitting down and knitting sock #2. I did not cast on the second sock last night - mostly because it was getting late, and we were watching a tribute to Hal Fishman (the KTLA news anchor who passed away yesterday) I was tired and getting a little sad thinking about my dad, and it was so late that I needed not to start it yet... 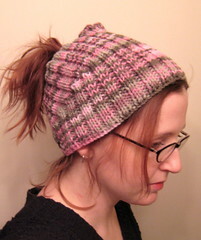 I want to try to find a similar repeat location in the next ball of yarn so that I maybe get a similar patter on sock #2. That's it for now - I'm happy about my sock - and excited about the wheel :) If anyone has any suggestions about buying a spinning wheel please let me know - I take my first spinning class on Saturday and I just know that I'm going to love it :) - if I am not somehow convinced otherwise, I will probably buy the Minstrel next week! You are way too funny. The sock looks great. How much Noro Silk do you use oer sock? Have you tried out any wheels yet? If not, you may want to try out several different brands before you buy. I have a Minstrel that I impulse-bought because it was so pretty, and it can be a little fussy sometimes. It also has pretty small bobbins compared to my Louet wheels.